The oasis town of Mulege is situated at the mouth of the Río de Santa Rosalía. 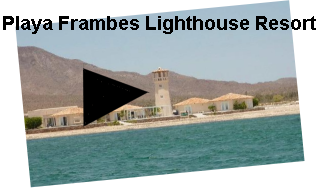 Mulege offers nine restaurants, and five famous hotels: Playa Frambes Lighthouse Resort, Las Casitas Hotel, Hotel Cuesta Real, Hotel Serenidad, Hotel San Buenaventura, which are well known for the hospitality the show to guests. The major attraction to Mulege are the water activities in the Bahia Concepcion and its spectacular beaches. Diving and fishing are excellent. Waters are typically warm and inviting. With a population of nearly 4,000 Mulege still has a neighborly town environment, small enough to walk across the village, but with a active economy, primarily fishing. Baja California is an area with one of the lowest precipitation rates in the world. The river oasis and irrigation make farming possible like nowhere else in Baja California, farming is focused on all sorts of produce; Mangoes grow well in the climate, and are served in local resturants. Improving road conditions has expanded services, Including an airport and museum. In 1705, Juan Maria Basaldúa and father Juan de Ugarte founded the mission and named it Santa Rosalía de Mulegé and a point of interest for history buffs. Preheat outdoor grill to medium heat and oil the grates using a brush or paper towel. In a small bowl, mix the chile powder, salt, and pepper together. Coat the yellowtail fillets with a light layer of olive oil and sprinkle with the chile mixture. Place each fillet flesh side down on a hot grill and cook for about 3 minutes. Flip fillets over and cook for an additional 3 minutes. Remove from grill and top with Mango Salsa. To make mango salsa, combine (2 mangoes, small dice, 1 medium red onion, small dice, 1 cucumber, peeled, seeded, small dice, 2 jalapeno peppers, minced, 1/4 cup cilantro leaves, chopped, 1/2 tablespoons ancho chile powder, 2 large limes, juiced, 2 tablespoons olive oil, Salt) together in a medium bowl and stir well. Keep refrigerated until ready to use.